When you contact us about an issue with a WatchDirectory task we may ask you to send us the settings and history for us to look at. 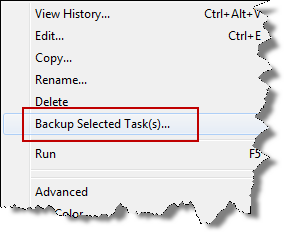 We may also ask you to enable "Debug" for your task before you send us the backup. This posts has all the tiny little details. On the "Other Settings" window enable the option "[X] Write Debug Info". Now run the task. After a while, when you know the problem has occurred again, stop the task and create the backup for us (see further down below). If the task is an FTP (Upload) Task, there is an extra "debug" setting you need to enable, "[X] Write FTP Conversation to History". This will output all FTP commands and responses to the history database. Just before you backup this FTP task, you may want to edit it again to temporarily change the username/password. The encrypted password is stored inside the backup. Right-click the task, a context menu opens. This will create a ZIP file of your task settings and its history for us to look at. If you want to look into the history info yourself and you are not familiar with WD's History Viewer, please read the post How Task History Works first.